A short story by Börkur Sigurbjörnsson. A university professor is waiting for his connecting flight at Bogotá International Airport when he is drawn into a conversation with the man sitting next to him. Annoyed at first with being disturbed, the professor gradually becomes interested in the curious tale the man has to tell. 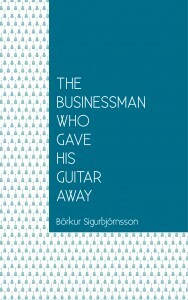 The Businessman Who Gave His Guitar Away is available for download in the Kindle Store and in the iTunes Store. See more ratings and reviews on Goodreads.